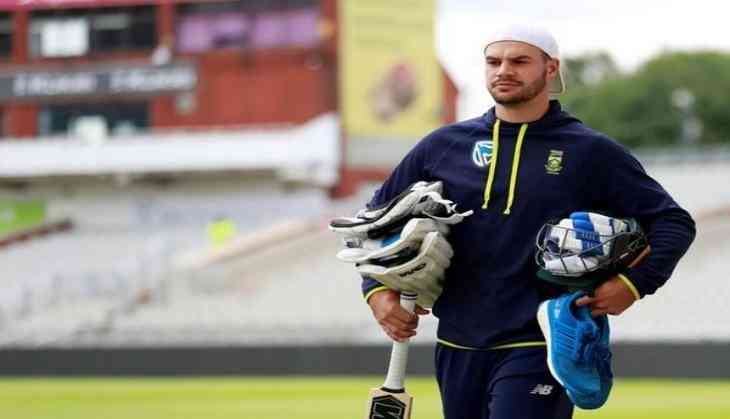 Aiden Markram, who was appointed as South Africa's stand-in skipper in absence of injured Faf du Plessis, has admitted that leading the national side in the recently-held unsuccessful ODI series against India was `tough`. Markram took over the captaincy after du Plessis was ruled out of the remaining series and T20Is due to an injury in his right index finger which he sustained during the first ODI against the Virat Kohli-led side. However, Markram failed to meet the national selectors' expectation, winning just one of the five matches in charge as South Africa lost the six-match series to India 1-5 following their eight-wicket defeat in the dead-rubber sixth and final ODI in Centurion. Not only as captain, Markram also failed to click with the bat as he managed just 127 run at an average of 21.16 during the series. Talking about his first experience as the national side captain, Markram said even though he knew that the Indian series would be a tough one, he really enjoyed the challenge. "It was obviously tough and it was always going to be tough. Having said that it was something I was looking forward to and it was a challenge I really enjoy. I can still say that sitting here having lost the series 5-1,"Sport24 quoted, Markram as saying. He further explained, "I learnt a lot, and learning a lot at this stage of my career is not a bad thing. Going forward I'm just going to try and take lessons that I did learn if I ever captain again." Markram, meanwhile, also admitted that India had been a much better side throughout the series, adding that his side were once again outplayed in the last match. "The guys rocked up with a very good attitude today and were prepared to go the distance, but unfortunately it wasn't the case. Yet again India played some really good cricket. We were just outplayed again," Markram said following the sixth and final match. After being asked to bat first, South Africa posted 204 with the help of Khaya Zondo's half-century. Shardul Thakur was the pick of the bowlers for India as he bagged a four-wicket haul after being called in the squad as Bhuvneshwar Kumar's replacement. In reply, India chased down the target without any fuss, as Kohli single-handedly contributed 129. Openers Shikhar Dhawan and Rohit Sharma struck 18 and 15 respectively while Ajinkya Rahane was unbeaten on 34. Kohli was awarded the man of the match and also the player of the series as the 29-year old ended the series with 558 runs, which include three centuries (the only Indian to notch up three tons in a bilateral series) and a fifty.